ShiraDrissman.com: Need a Flu Shot? Go to Gitmo! Need a Flu Shot? Go to Gitmo! Yes, it's true. Despite the flu shot shortages across the United States, our Gitmo detainees are getting vaccinated against the "Swine Flu". The Pentagon will offer the H1N1 vaccination to detainees at the U.S. facility at Guantanamo Bay, officials there said Friday. The Pentagon made the decision based on U.S. government assessments that people held in detention facilities are at high risk for the pandemic, said Maj. Diana R. Haynie, a spokeswoman for Joint Task Force Guantanamo Bay, which is in charge of holding the suspected terrorists. "Detainees at JTF Guantanamo are considered to be at higher risk and therefore they will be offered the H1N1 vaccination," Haynie said. "JTF Guantanamo conducts safe, humane, legal and transparent care and custody of detainees. As such, we must provide detainees the medical care necessary to maintain their health," she said. Wait, I'm confused. Why are the detainees (a.k.a. 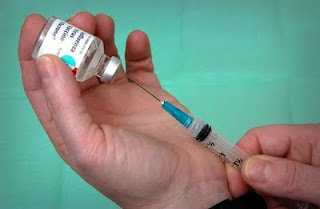 terrorists) getting the H1N1 shot again? Because they're at higher risk? How is that possible? Aren't they stuck on an island? Have any of them traveled to Mexico lately? Can someone explain this to me please. The vaccinations will be voluntary for the detainees, who will be briefed on the virus and the vaccine prior to deciding whether to receive the latter. This is great. I would love to see this. These terrorists will be "briefed on the virus and the vaccine". We're treating these people as reasonable, thoughtful individuals who don't have an interest in seeing all of us dead. Again, I'm confused. Didn't we pick these people up on the battlefield murdering our soldiers? Aren't they in Guantanamo because they are dangerous? Some of the detainees have already voluntarily taken the seasonal flu shot, Haynie said. I feel better now. So while there are shortages all over the United States (and Canada) of the H1N1 vaccine and the regular old flu shot - our Gitmo guests are ahead of the game and already have gotten theirs. I'm glad to hear it. "There is no vaccine in Guantanamo, and there's no vaccine on the way to Guantanamo," White House spokesman Robert Gibbs told reporters today. He directly contradicted a spokesman at the US naval base at Guantanamo Bay, who had said that guards and then detainees were set to receive the vaccinations later this month. Hasan is NOT a PTSD Victim!